For the next week or so, I'll be posting about kitchens. 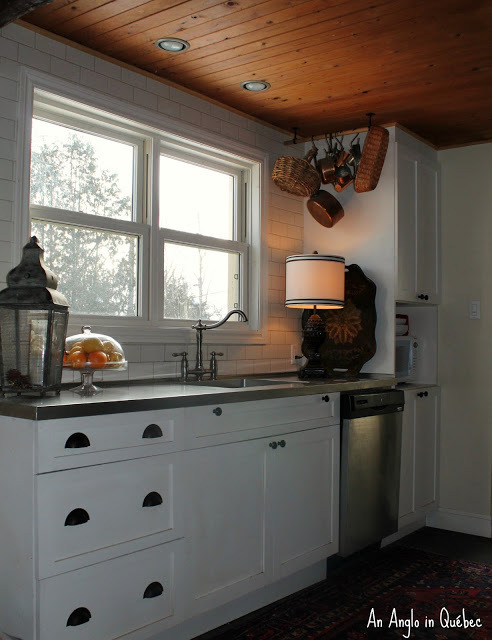 One of my favorite kitchens in blogland is Donna's adorable cottage kitchen @ An Anglo in Quebec. If I could plan a kitchen from scratch it would look very similar to Donna's. 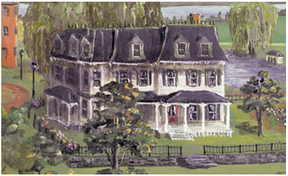 Donna has an open concept cottage, and her kitchen is directly open to the living room and dining room. What I love about her kitchen is that it's organized into zones: There's a work island, a cleaning zone with the sink and dishwasher, a cooking zone, and a pantry/laundry area. Don't you just love the skirt? It hides the washer and dryer. I think every laundry room should have a window. Her floors are pretty, too. Two elements I love in this kitchen: the subway tiles and the ceiling! I like the countertops, too! That funky little hood just keeps growing on me. The powder room is located opposite the yellow-striped skirt in the pantry. 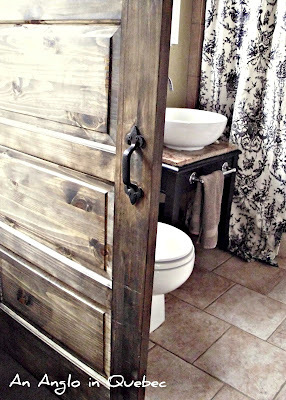 The barn-style door slides for privacy. Please visit Donna here and tell her "Hi!" I love Donna's kitchen too. 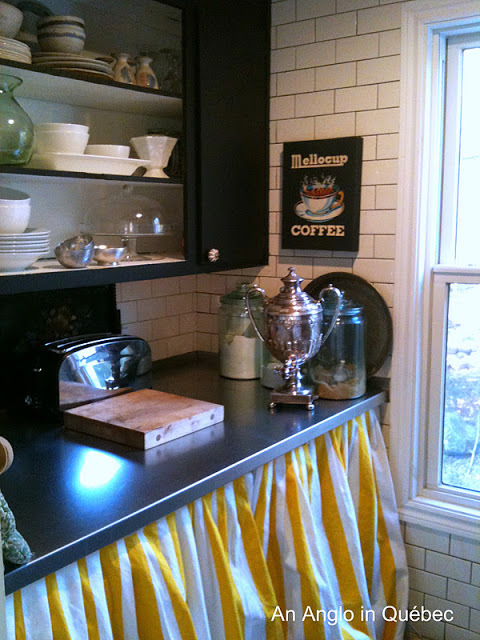 The skirt is a great way to add some colour and of course the subway tile is gorgeous. I'm grabbing a few minutes at an Internet Cafe, because my Internet and Email are still down -- hopefully back up early next week. Just wanted to pop in and say "Hi!" 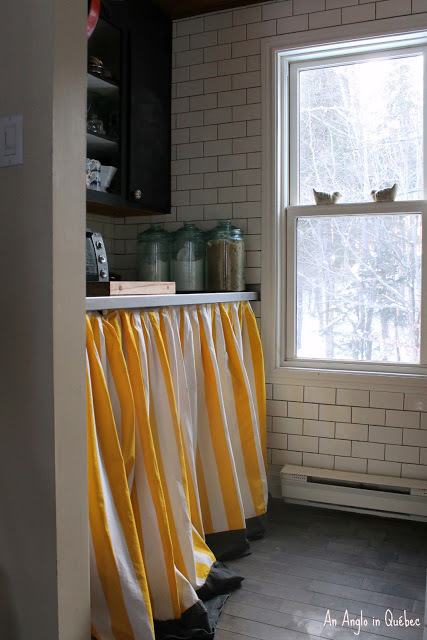 This cottage kitchen is absolutely adorable, and I love using skirts to hide the unsightly! You may not have done much Valentine decorating, but what you did was so very sweet! We went to another book signing this past week. J.A. Jance this time. Have you ever read any of her books. They are truly mind-candy, so simple and quick to read. She lives part-time in Tucson and the rest in the Seattle area. One of her characters is a female sheriff in Bisbee, AZ, another in Sedona and one in Seattle. She was extremely entertaining -- had such a good time! Very useful, especially as I will be planning the kitchen in our renovation soon. I can see why you like it so much! It's very pretty. I love the black and white accents. We must have a similar eye - I look first and then read. I saw the yellow striped canvas and swooned and then you mentioned it. I saw the wonderful door to the bath and then you talked about it. Thank you RJ for such a lovely post on my little kitchen. It truly is the heart of our home so I will be making a toast to you and your new kitchen when I get back there. Still holidaying on the west coast but dropping in to see you. Take Care! 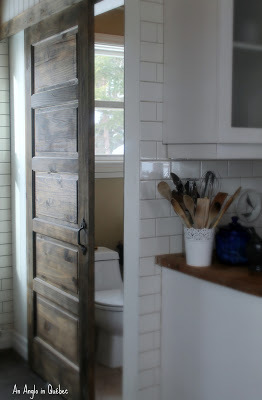 Very nice indeed, I would love one of those doors instead of the boring looking door I have that seperates my kitchen and laundry. I do love this kitchen. That yellow striped skirt caught my attention ages ago. Doesn't she have another skirt she uses at Xmas. Seems like I remember that. Really nice. That wood ceiling is so warm and cozy. I would LOVE to be able to redo my kitchen. 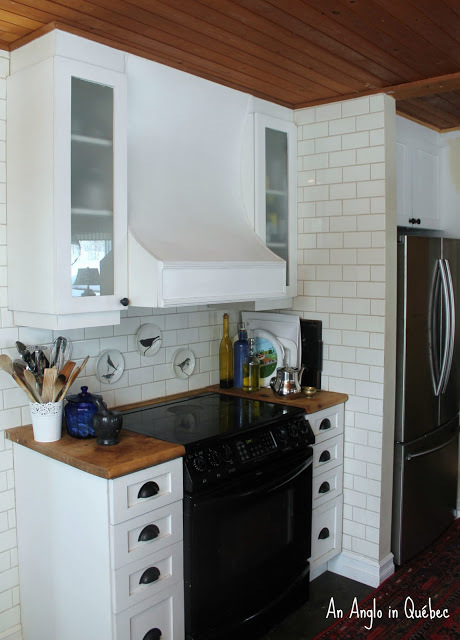 I adore that subway tile! 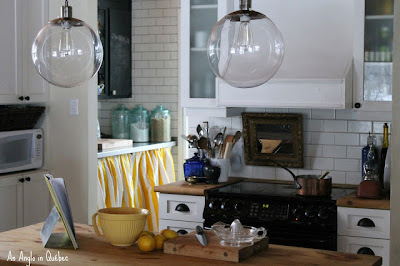 I've loved Donna's kitchen since the first time I visited her blog. It's so homey and real yet very classic. I've been thinking about putting a grain sack skirt under my sink. I just might have to do it. Donna's skirt looks wonderful! Hope all is going well with your kitchen reno. Hang in there...it will be worth it! Such a sweet kitchen, love the tile and the skirt! 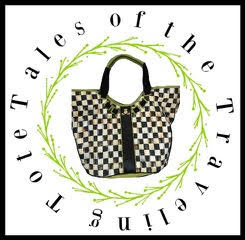 It was Donna's kitchen that drew me to her blog in the first place. She has such a great sense of style mixed with comfort! Oh my goodness--I LOVE this! These are my cabinets (which I can't replace) and after I see them here, I might be convinced to work with them. I'm so glad you featured Donna's kitchen, it is really gorgeous, isn't it. I, too, love the counter tops, the subway tile and the ceiling. 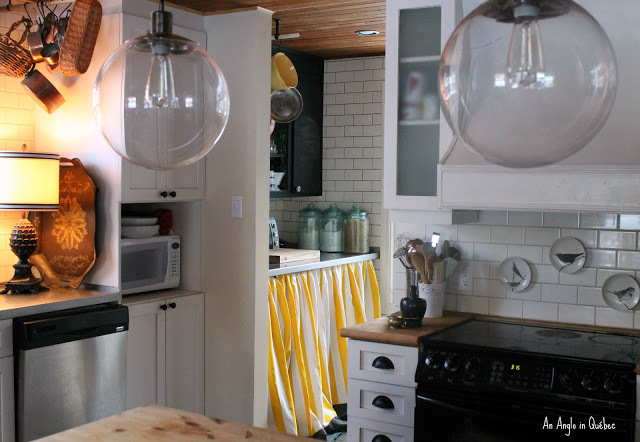 I always love catching a glimpse of her kitchen on her blog. I love her kitchen! It is so charming and approachable and she does so much with a small space.